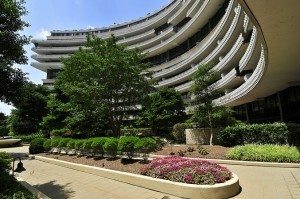 On the Arlington side of the Potomac, The Waterview notched the highest sales price standings, while across the river in Foggy Bottom, The Watergate scored the most units sold in June with four! Both are my choice for Best Views in our It Buildings List. With a full-price sale at $2,070,000, a 29th floor Waterview penthouse high above the Le Meridien Hotel boasted 2,260 Sq. Ft. of exquisite finishes, entertaining space, and luxurious private quarters including 3 bedrooms and 3.5 baths overlooking Rosslyn, Arlington, and Georgetown. At The Metropole in Logan Circle, a dramatic 3 bedroom, 3.5-bath penthouse on two floors closed at $1.9 million. And in Friendship Heights, a beautifully upgraded Chase Point 2 bedroom, 2.5-bath residence sold for $1,665,000. Units 1102 and 1103 at The Watergate were combined and sold as one fabulous penthouse with 3 bedrooms and 4.5 baths for $1.3 million – one of four sales in June at the Foggy Bottom landmark. Two buildings – Kalorama Lofts in Adams Morgan, and Wooster and Mercer Lofts in Arlington — tied for second place. Paying Over List? No Doubt About It! Buyers had no qualms bidding over the list price to get the luxurious units they crave. Six different buildings showed sales above 100 percent of list, topped by Logan Circle’s Solo Piazza at 108.68% for a 2 bedroom, 2 bath unit listed originally for $599,000 and sold for $651,000! The Waterview Also Ranked Highest per Sq. Ft. in June! That 2,260 Sq. Ft. Rosslyn penthouse with 3 bedrooms and 3.5 baths was sold for $915.93 per precious square foot.